Annan lifted the points and made a giant step towards securing one of the play off positions after disposing of second placed Edinburgh City on a wet dismal day at Galabank. Annan lifted the spirits of the poor crowd who turned up to support the black and golds with a superb performance on how to manage the match. The game was in doubt with the heavy rain ceasing before kick off but the strong wind was a concern, referee Craig Napier gave the go ahead for the match to proceed. Annan manager Peter Murphy changed his line up from the side which tasted defeat up at Peterhead and there were a few eyebrows raised when Tony Wallace’s position was given to Owen Moxon and Alex Mitchell replaced Aidan McAdams in goal. City were at full strength but their hopes were dealt an early blow when Joshua Walker pulled up during the warm up and his position was taken up front by Scott Shepherd. City came to Galabank on the back of some decent form and still in with a chance of the title but on Saturday they faced an Annan side who were up for the task and City left Galabank with their title hopes virtually in tatters as they now trail Peterhead by 5 points who also have a game in hand. Annan had to face the very strong wind in the first half and their tactics managed to frustrate the City attack who never really got to grips with the conditions. The early signs were promising for City with Mitchell pulling off an excellent save pushing Craig Thomsons 4th minute effort round the post. City continued to pin Annan back forcing numerous corner kicks but Annan defended in numbers to frustrate the visitors. The visitors had claims for a penalty brushed aside in the 21st minute. City were unable to make any impression against the determined Annan defence and Annan keeper Alex Mitchell was never really seriously tested. 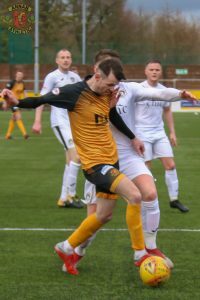 Annan forced their first corner of the match in the 35th minute and from the corner Annan went ahead when Aidan Smith was fouled on the edge of the box by Adam Watson and there were no complaints as the referee awarded Annan a penalty kick. Aidan Smith stepped up to send Callum Antell the wrong way and give Annan the lead. The goal gave Annan a lift and they started to test the City defence and in the 41st minute they cut open the visitors defence ending with David Wilson being fouled by Gareth Rodger just as Wilson was about to pull the trigger from 6 yards. The outcome was another penalty to the home team but this time City were let off the hook as Annan missed a golden opportunity with Aidan Smith’s spot kick saved by Antell. The second half started with the conditions improving and City made a promising start culminating in a free kick being awarded wide on the left and Craig Thomson’s 52nd minute free kick was well placed with Swinglehurst and Henderson going for the ball and Henderson managed to get down to head Swinglehurst’s kick past Mitchell form 6 yards. Annan responded with a Kyle Bradley effort from the edge of the box which went narrowly past the post. Minutes later Annan won a corner and Chris Johnston’s delivery found Steven Swinglehust powering in at the back post to head Annan ahead in the 57th minute. The goal tipped the balance in Annan’s favour. Minutes later Aidan Smith won a free kick on the edge of the box and Wilson’s effort struck the cross bar. Shephered was ruled offside in the 65th minute. Annan continued to press forward and an excellent move down the left ended with Owen Moxon picking out Annan’s Christain Nade who’s powerful header gave Antell no chance and pushed Annan into a 3-1 lead. Both teams made changes but worrying for Annan was the departure of Nade in the 91st minute with a head injury but the deserved victory maintains Annan’s chances for a play off place with 7 games to play. City’s title hopes although not totally lost face an important match next week when they entertain Peterhead where victory would be essential to revive their fading title hopes. Annan face 2 important matches starting next week at Clyde and then a trip up to Elgin City. ANNAN ATHLETIC- Alex Mitchell, Scott Hooper, Lewis Strapp, David Wilson, Peter Watson , Steven Swinglehurst, Owen Moxon ( Tony Wallace 85 min ), Kyle Bradley, Aidan Smith, Christain Nade ( Tommy Muir 91min), Chris Johnston. SUBS NOT USED- Aidan McAdams, James Creaney, Arton Sonkur , Ross Ferguson, Jack Brannan. EDINBURGH CITY- Callum Antell, Craig Thomson, Robbie McIntyre , Andrew Black, Conrad Balatoni, Mark Laird, Scott Sheherd ( Ciaran Diver 81 min ) Blair Henderson, Graham Taylor ( Regan Lumsden 81 min), Gareth Rodger, Adam Watson ( Cai Macdonald 85 min) .SUBS NOT USED- Bradley Donaldson, Luke Kennedy, Fraser Morton GK. The weather caused Chaos in Scotland last week with 2 matches in SPFL 2 being called off Albion Rovers v Cowdenbeath and Berwick Rangers v Peterhead. Clyde lifted all the points with a 3-1 home victory against Stirling Albion and Queens Park dented Elgin City’s chances of making the play off with a 4-1 victory at the National Stadium.